﻿ Davis Shows Northwest ~ We Offer Safe, fun, family entertainment! Davis Shows Northwest Offers More. As an event organizer or sponsor, you have enough to worry about. When you ask Davis Shows Northwest to provide the entertainment at your next event, you can rest assured that we will take care of just about everything. We can offer you a varying amount of rides, games and food concessions, according to the size of the event and what space will allow. We have over forty amusement rides, thirty game consessions, and eight food consessions to choose from. We can work with odd lot size dimensions, medians or light poles. We usually pay a percentage to our sponsor, concessions are a flat rate. We also rent rides. We charge a flat rate for ride rentals at private events. We are able to provide chemical toilets and garbage dumpsters if facility dumpsters & toilets are not available. We also provide seating, shade tents, misters, and night lighting as needed. The carnival area will be cleaned every night at the closing of the show. We will also clean the area prior to leaving the grounds. We like to ensure our customers safety at all times and we take several steps to be sure we do all we can to prevent any accidents. Rides are inspected daily by maintenance personnel to be sure they will function property and safely. To learn more about our dedication to safety, CLICK HERE. We also carry a substantial amount of liability insurance. Overhead wires can sometimes a problem for some of our rides. Individual ride setup spots may need to be changed if overhead wires pose a danger. We do need to be supplied with water. Davis Shows N.W. works on a coupon system. The coupons are $1.25 for individual coupons or $22.00 for a book of 24 coupons. Rides take 3- 4 coupons each. We often do special promotions thru stores and schools. 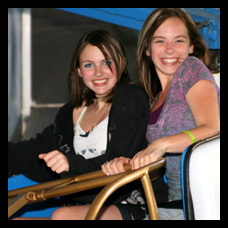 We also have armband days and family days, with special prices for ride coupons. No money will be accepted at any of the rides. Money is accepted and tickets/armbands are purchased at designated ticket booths. We sometimes offer special promotions for handicap organizations in conjunction with certain events. If prior arrangements are made, we often allow the members of the handicapped organization to ride the rides free of charge, sometimes even before the normal show hours. We also like to do a presale program thru you the sponsor. This saves the public money and you get a higher percentage on the revenue. If fuel costs are high, it may be nesccessary for our company to implement a Fuel Surcharge, agreeable by both parties. All of us here at Davis Shows Northwest, look forward to serving you with a safe and fun show. Questions? Want to sign up? Visit our CONTACT US page to find the most convenient way to contact Davis Shows Northwest.